ANSWER: You accept them all.What would possibly go wrong? 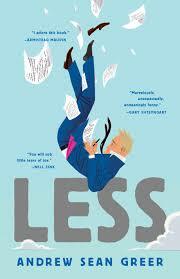 Less won the 2018 Pulitzer Prize for Fiction. In reporting the award, the Associated Press accidentally wrote the novel's title as "Fearless." The book also was a New York Times best seller, won the Northern California Book Award, and was a finalist for the Lambda Literary Award for Gay Fiction. Andrew Sean Greer was born in November 1970, in Washington, D.C., the child of two scientists. He grew up in Rockville, Maryland. He is an identical twin. He graduated from Georgetown Day School. He lives part time in Italy. He is the author of six works of fiction. Greer taught at Freie Universität Berlin and the Iowa Writers Workshop. He was a finalist for the Premio von Rezzori for a work translated into Italian, as well as a Today Show pick, a New York Public Library Cullman Center Fellow, and NEA Fellow, and a judge for the National Book Award.